In a country like America, a large number of people come up with their blood pressure problems every year. The health problem like high blood pressure has now become a major concern as it may also leads to many other life threatening disorders like chronic heart diseases, stroke, kidney failure and many more. The high blood pressure condition mainly includes the situation when the force or pressure exerted towards the arterial wall by the flowing blood and raises to an abnormally high value in the body. The high blood pressure is dangerous because people do not even come to know about its presence in the body as no prominent signs or symptoms are really associated with it. Several factors such as, unhealthy lifestyle, lack of exercising, uncontrolled alcoholism etc, are responsible for causing high blood pressure state. 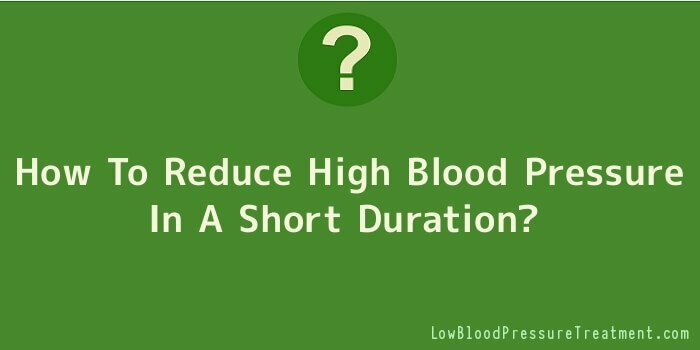 However, such high blood pressure state may also develop with age in many people. And such type of blood pressure condition is referred as primary hypertension. However, there is possibility of secondary hypertension when high blood pressure condition results due to some underlying conditions associated with the body such as, presence of some critical diseases like diabetes. It is not at all possible to bring down your high blood pressure immediately and it is not even possible in practical manner. However, here we are listing some tips or say preventive measures to have a control on your high blood pressure condition and prevent you from the threat associated with the later consequences of high blood pressure condition. As you know, lack of exercises is one of the major causes for resulting high blood pressure condition in the body. Therefore, even a brisk walk for thirty minutes on daily basis can successful help you in dealing with high blood pressure condition. Dehydration can also be one of the serious causes for raising your blood pressure level in the body. Therefore, you must try to drink water as much as you can. Keep a water bottle with yourself all the time. Practicing deep breathing exercises can indeed greatly contribute in regulating your high blood pressure state in your body. hence, once you get to see any major sign or symptom of high blood pressure condition, you must start off with some deep breathing exercises or forms like yoga. The electrolyte present in your body needs to be maintained for adequate blood pressure and healthy heart. For this, potassium element plays a highly crucial role for establishing a healthy electrolyte balance in the body. The food items such as, avocado, oranges, legumes, salmon etc, are considered as richest source of potassium and can greatly help in lowering the blood pressure as quickly as possible. A tiny piece of chocolate can also wonder in terms of bringing down the sudden high blood pressure condition in your body. The chocolate component greatly helps in dilating the arterial wall and hence, immensely contributes in lowering the blood pressure. Some of the food items such as, ginger and garlic that are easily accessible in every kitchen are found to be extremely useful in lowering the high blood pressure level. As a whole, adopting few crucial habits such as, more dependence on fruits and vegetables and cutting down the intake of salt etc, can successfully contribute in regulating your high blood pressure value in the body. Blood pressure is a sort of mechanism in our body which is required for our blood to flow to various organs and also contributes in the fine working of the body. However, as long as the blood pressure is normal; there is no need to worry about. If it goes above its 120/80; then the causes of the high blood pressure needs to be investigated. Once a person is victim to blood pressure then their entire life is dependent on medications. Medications to some extent are bearable but long term use of medications will also have side-effects. Thus it is always better to stop the blood pressure in the initial stage before it reaches the hypertension stage. A healthy body is less prone to the side-effects of blood pressure. The best way to reduce blood pressure is by taking a brisk walk. Exercise and good work out will enable the heart to use the oxygen effectively. Thus exercise for 4 or 5 days a week and exercise should include walking. If you are not used to walking then start with 15 minutes of exercise and slowly incorporate walking in your routine. Include potassium rich diet in your food. It is a known fact that we all love the taste of foods rich in sodium, but, sodium rich food is unhealthy for blood pressure and hence consuming potassium rich diet will help in countering the adverse effects of consuming sodium rich food. Eat fruits and vegetables such as sweet potatoes, tomatoes, orange juice, bananas, peas, prunes and resins and such foods which have good amount of potassium. Take up meditation. Meditation is a good technique to reduce stress and also helps in breathing. Many people don’t breathe properly and some people suffer from breathlessness due to hypertension. In such cases meditation will help in controlling the breathing. Devote at least 10 minutes twice a day for your mediation. Eat dark chocolate as it has flavones in it which makes the blood vessels more elastic. However frequently eating dark chocolate is not advisable especially if you are obese or diabetic. It is always better to avoid salt in your food whether you have blood pressure or not. Reducing salt in the food is always beneficial. If you can’t completely avoid salt, substitute it with lime, garlic, pepper, spices or such other herbs. Avoid canned or packaged food such as chips, bacon or chicken. Avoid caffeine and instead drink herbal tea or green tea. Hibiscus tea is good for lowering blood pressure. Such teas are better than caffeine containing tea or coffee as caffeine containing beverages may cause increase in pressure. Avoid alcohol as much as possible. Though a glass of alcohol may have its own benefits like preventing heart attack or coronary heart disease but more than a glass of alcohol will have only disadvantages and no benefits. Consuming three to five drinks in a row is enough to increase your blood pressure. Try not to be a heavy drinker and control your alcohol intake.